Adult-onset Still's disease (AOSD) is an inflammatory disease of unknown cause characterized by a high spiking fever, arthritis and evanescent rash. The mainstay of treatment is glucocorticoids with or without immunosuppressants. Recently, biologics such as anti-tumor necrosis factor (TNF) antibodies have also been tried in certain refractory cases. We have had two cases of AOSD which were treated successfully with anti-interleukin (IL-) 6-receptor antibody, tocilizumab (TOC). (Case 1) A 36-year-old woman who was diagnosed 8 years previously, and had been treated with various DMARDs plus etanercept (ETA) or adalimumab, presented with a high spiky fever and elevated liver enzymes. After excluding infection, she was treated with TOC. (Case 2) A 26-year-old man with new-onset AOSD, which was shown to be resistant to multiple immunosuppressants including infliximab and ETA, was treated with TOC starting 7 months after the diagnosis. In both cases, serum IL-18 was extremely high, and TOC promptly improved clinical symptoms and liver function. 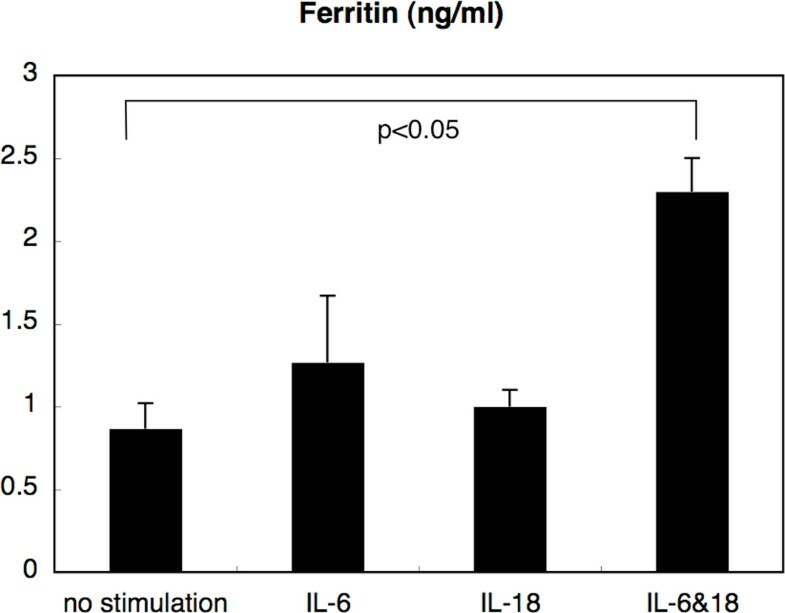 The high level of serum ferritin also became normalized. Interestingly, especially in case 2, the level of IL-18 remained high after the administration of TOC, suggesting that IL-18 is located either upstream of, or at the same level as, IL-6 in the pathogenesis of AOSD. Next, we cultured human monocytes derived from healthy controls with or without the presence of IL-6 and/or IL-18 in vitro. The level of ferritin in the supernatant was significantly increased only when both IL-6 and IL-18 were added, indicating that IL-6 and IL-18 have a synergistic effect on the production of ferritin (Figure 1). TOC can be a first-line biologic applicable against multiple-drug-resistant AOSD. If an IL-18 blocker is developed, however, it may be even more beneficial in that it may block the cascade of inflammation at a point further upstream.